The Sony A6000 vs Sony A6300 debate is going to rage while both cameras are on the market together. Many photographers looking to purchase their first Sony Mirrorless camera system will likely look at both of these options and try to decide which is best for them. Current owners of the A6000 (like myself) are likely trying to decide if they should upgrade to the A6300 or keep their current A6000. Read my Sony A6000 vs Sony A6300 comparison to see what I recommend and see the differences for yourself. From the front there are not any changes other than the texture of material on the grip and Sony did away with the “APS-C” label on the bottom right. Here is where we see the biggest difference between the Sony A6000 and the A6300 – the A6300 is slightly thicker in the body than the A6000. This is noticeable when you go from one to the other, but not a significant difference. Other than the change of the model label and the addition of the 4k label the only other difference is the mode dial options. Sony has dropped the Intelligent Auto Plus and the MR options and replaced them with “1” and “2” for saving your own custom “scene” modes. This gives the photographer even more control to switch between 2 common settings quickly and easily. 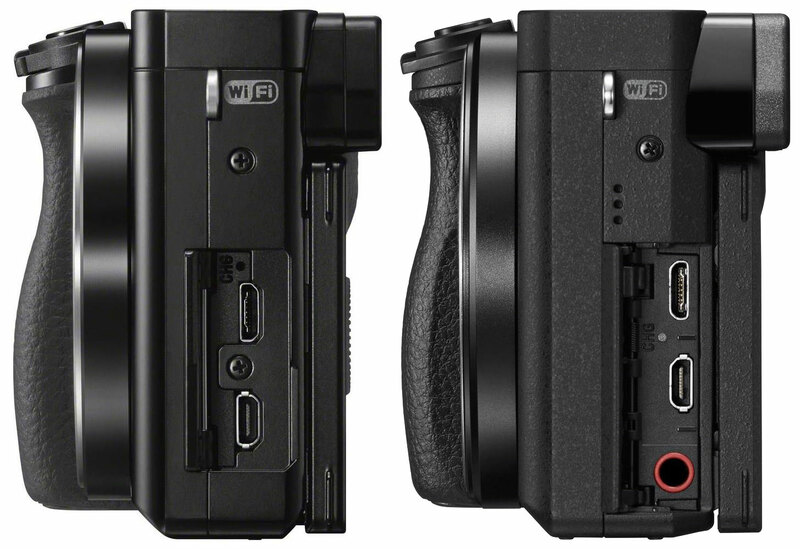 Here is the other change between the A6000 and the A6300, the A6300 has added a standard Mic In jack. The A6000 offered a hot shoe accessory Mic you could use, but it only worked on Sony cameras, making it difficult to set up a better mic on the A6000. When I recorded my “Fall Photo Tips” video I used my A6000 and recorded my audio separately on an Olympus voice recorder using a stereo lapel mic. This meant I had to sync up my audio in post very carefully or my video would be like the old Godzilla movies. For more serious video this is another welcome change (along with the 4k video recording). The A6300 is a distinct improvement over the A6000 in several ways making it a slam dunk winner on paper. That is, until you take Price into account. The difference in price is $500 between the two cameras. Of course the A6300 will probably come down in price, but not until the supply of A6000 cameras is depleted. So what is my recommendation? If you can afford the A6300 then you should get it! The better Auto focus, Viewfinder, 4k video and build quality are all significant upgrades. But if you budget won’t allow you to get the A6300 then the A6000 is still a very good camera and probably the best “bang for your buck” on the market at this time (December 2016). As far as Image Quality goes, my testing shows them to be very equal at base ISO, but at higher ISO’s the A6300 is *slightly* better, but not something that I think would show in prints, but does at 100% pixel peeping. Overall I call this a wash between the two cameras. I love my A6000 but plan to upgrade to the A6300 in the future. But before I do, I plan to get the Zeiss 16-70mm f/4, the Sony 10-18mm f/4 lens, the Sony 35mm f/1.8 OSS lens and either the 70-200mm f/4 or the 70-300mm f/4-5.6 lenses. In other words, it is not my top priority, but it is on my wish list. based on 1396 user reviews online. Dimensions (WxHxD) 4.72 x 2.63 x 1.78 in. 4.7 x 2.6 x 1.9 in. Weight Body Only 0.63 lbs. w/ Battery & Card 0.89 lbs.